As the humpback whale population has grown in recent years, close calls and interactions between humans and the cetaceans have grown increasingly more common. Last week, several kayakers off the coast of British Columbia were fortunate enough to have front-row seats for an amazing display. The adventurous explorers were near the Penn Islands watching a mother humpback nurse her calf just below the surface. After nearly a half hour, the duo finished the feeding and their tails emerged from the water, appearing to head off to the depths of the ocean. However, the whales had something else in mind, and the kayakers were unknowingly about to experience a once-in-a-lifetime performance. To the delight of the onlookers, the calf reemerged from the sea for a full breach. The leader of the kayaking group quickly advised the seafarers to begin paddling back for safety. Baby humpbacks are between 10 and 15 feet long and can weigh up to one ton, so the splashes alone could be dangerous to kayaks and small boats. As they began their retreat, the group was treated to an even more impressive sight when the mother appeared right in front of them for another breach. Adult humpbacks can be up to 50 feet long and weigh 52 tons, so this display of beauty and power was far greater than the calf's. 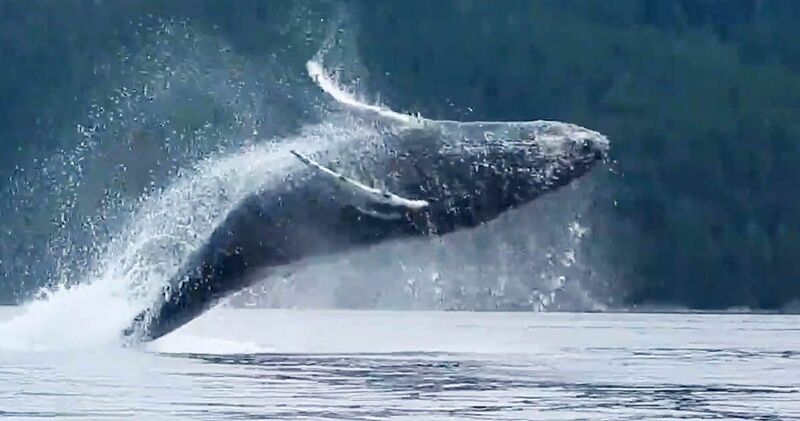 Humpback whales are beloved by whale watchers because of their acrobatic displays when they breach. It can be assumed that both mother and calf were pleased with the feeding because breaches such as this are a sign of excitement. Surely the onlookers were excited as well. Kayaking can be a great way to get your blood flowing, but these kayakers most likely found that their hearts were beating a lot faster than normal on this trip. Take a look at the incredible video. Would you risk an overturned kayak for such a thrilling encounter, or would you rather watch the video from the safety of your home?